Calling a tail a leg doesn't make it a leg.! Before reading the parable of Lincoln, I had phrased my question in this way (and that was way before the birth of my kitten Haiku-Kun). Maybe a very badly damaged dog, unable to live up to his nameing. Or maybe reborn as something completely different, vaguely ressembling his former self? AAAA, what are we to make of this? How to name the new creature ?
. 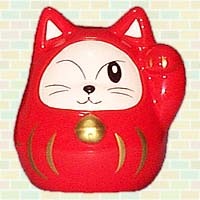 And here is why Daruma has only one sandal ... .
"Say a good word if you want to save the cat!" Nansen went to the kitchen, brought back a big cleaver, and chopped the cat in half. He gave one-half to each group. That night when Joshu returned to the monastery, Nansen told him the story. Joshu said nothing; but he took off his sandals, balanced them on his head, and walked away. Nansen said aloud, "Joshu could have saved the cat." In an international haiku community, there are many options based on many opinions. The patient has a right to informed consent. The poets are given enough information to choose what they can accept. An interesting ancedote, dear Gabi san. If you call a tail a leg, how many tales has a dog? I love Lincoln's parable (koan). To many people, there are many five-legged dogs about, eh? A dog lifts his tail and wags his leg? Very confusing, that!! Thanks, Chibi san, for understanding, smiling and wagging your tail !